Plunge into the New Year the Serenata Beach Club! If you’re not a Serenata Beach Club member, now is a great time to consider a membership! Why? Because New Year’s Day at the club will be filled with delicious food and shivering swimmers! From 10 a.m. to 2 p.m. the club will be serving a Breakfast Buffet complete with omelet station, smoked salmon display, waffles, bacon, sausage, biscuits and gravy, fruit, assorted pastries and beverage specials. Adults are $16.95, ages 6-12 are $7.95, and ages 3-5 are $4.95. Advanced reservations are recommended so call Serenata at (904) 823-3368 ext. 221 or email reservations@serenataclub.com to reserve your spot. 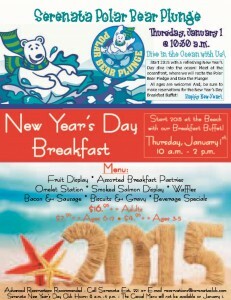 At 10:30 a.m. on New Year’s Day, Serenata will host a Polar Bear Plunge in the Atlantic Ocean! All member ages are welcome to participate, so plan to join in the fun with an invigorating dip with the other polar bears! There are several membership categories at Serenata Beach Club to suit any size family’s interests. The club hosts a popular kid’s surf camp during the summer, as well as many other kid’s camps and activities for adults. They also have a Fireside Book Club, Oyster Roasts, Golf Outings, Mah Jong, Ladies Bridge, live music, Dog Day Afternoons, trivia and more! For fitness nuts, Serenata has running groups, fitness groups and other great healthy activities.